Alphabet on Stone Holds Clues to 10th-Century B.C.E. 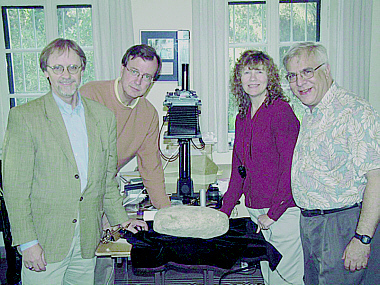 Shown with the stone are Ron E. Tappy, a professor at Pittsburgh Theological Seminary and director of the Zeitah Excavations (the Tel Zayit project); Kyle McCarter, the William Foxwell Albright Professor of Near Eastern Studies at Johns Hopkins and epigraphist for the Tel Zayit project; Marilyn Lundberg, associate director of the West Semitic Research Project; and Bruce Zuckerman, a professor at the University of Southern California and director of the West Semitic Research Project. A few weeks ago Kyle McCarter found himself in Jerusalem staring at the apparently blank surface of a 40-pound chunk of limestone and wondering if he had just made a hurried mid-semester trip to Israel for nothing. "I couldn't see a thing," said McCarter, the William Foxwell Albright Professor of Near Eastern Studies in the Krieger School. "The light was completely wrong." But when the light was right — raked sideways across the faintly scratched lines on the face of the rock — the stone gave up its ancient secret: a complete abecedary (the letters of the alphabet) written 3,000 years ago by a scribe living in a town that was probably a strategic western outpost of the newly formed kingdom of Judah. The inscribed stone was found last summer at Tel Zayit, an archaeological site about 30 miles southwest of Jerusalem, during excavations led by Ron Tappy, a professor at Pittsburgh Theological Seminary and director of the Zeitah Excavations, which include Tel Zayit. Tappy immediately contacted McCarter, who is the epigraphist for the Tel Zayit project, and together they assembled a research team that included Bruce Zuckerman, a professor at the University of Southern California, and Marilyn Lundberg. Zuckerman and Lundberg are director and associate director of the West Semitic Research Project, which is a leader in the photographic documentation of ancient inscriptions and manuscripts. Their expertise was essential for dealing with the special problems presented by such a faintly inscribed object. The team studied and photographed the inscription in Jerusalem in October and reported their findings this month at the joint annual meetings of several academic societies in Philadelphia. At the principal session, the moderator, Lawrence Stager of Harvard, described the inscription as one of the most important discoveries made in Israel in the last decade. But why is an incised alphabet from the 10th century B.C.E. so important? "Part of it has to do with the history of the alphabet itself," McCarter says. "The 10th century was the time when the Hebrew script was emerging as a distinct tradition." In fact, he says, a case can be made that the Tel Zayit stone is the oldest Hebrew inscription ever found. But the discovery is also important for the general history of the region, he says. The traditional view is that the 10th century was the Solomonic period, the time when the kingdom of Judah flourished and its capital, Jerusalem, was a rich and powerful city. Recently, though, some archaeologists have challenged this view, arguing that Jerusalem was little more than a rural village until the eighth century or even later. The archaeology of Tel Zayit shows that in the 10th century the site was linked culturally with the highlands to the east, not the coastal plain to the west, so that it was probably controlled by Jerusalem. Seen in this light, the discovery of the Tel Zayit inscription is strong evidence for the traditional view. "An abecedary is proof of literacy, probably even of formal scribal training," McCarter says, "and in this period that implies a fairly sophisticated level of culture and hints at a developed political bureaucracy." Even so, McCarter says he isn't ready to call this "King Solomon's Alphabet," and he stresses that Tappy's team will need another season or two of excavation to clarify the archaeology of the foundation wall in which the inscribed stone was found. What is already clear, though, is that Tel Zayit, which used to be neglected by scholars as a border site of minor importance, is emerging as one of the most exciting ongoing excavations in Israel. GO TO NOVEMBER 28, 2005 TABLE OF CONTENTS.